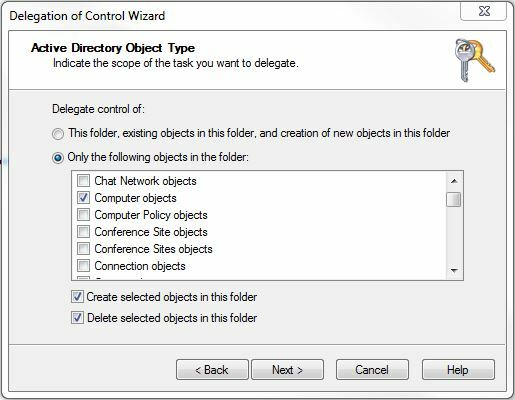 When trying to run the Optimize Hosts wizard within SCVMM 2012 R2 I received the error “Dynamic Optimization Cannot Be Performed At This Time” and “Object reference not set to an instance of an object”. 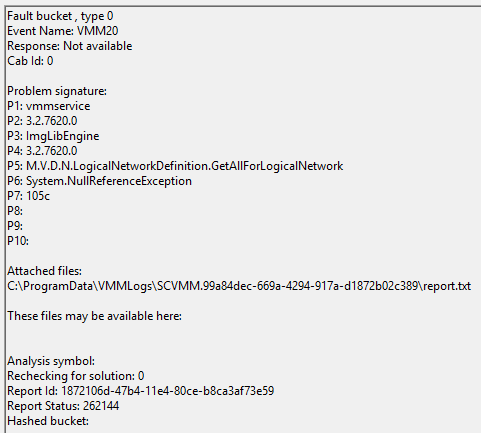 The Application Event Log on the SCVMM server contained a Windows Error Reporting event from the same time. Opening the event showed a link to the error log. Opening the error log showed that the error was related to a logical network issue on the cluster. This cluster has a converged network switch to which all virtual machines (VMs) connect. 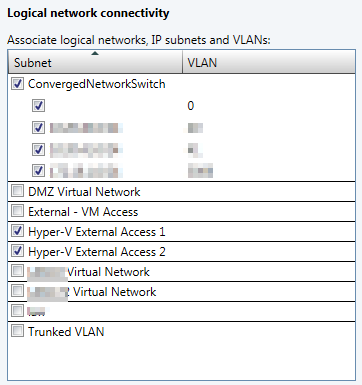 However, two additional logical networks are mapped to the switch to enable the migration of VMs which were connected to logical networks of a different name on a legacy cluster. 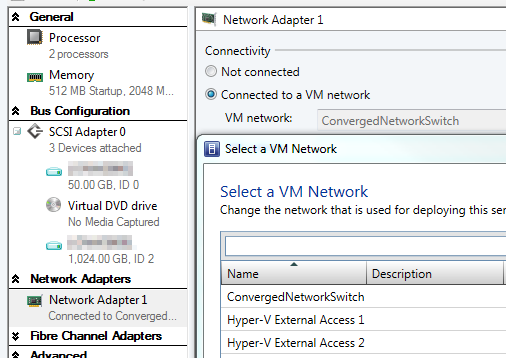 What I found is that some VMs were connected to the “Hyper-V External Access ” logical networks, rather than the ConvergedNetworkSwitch. 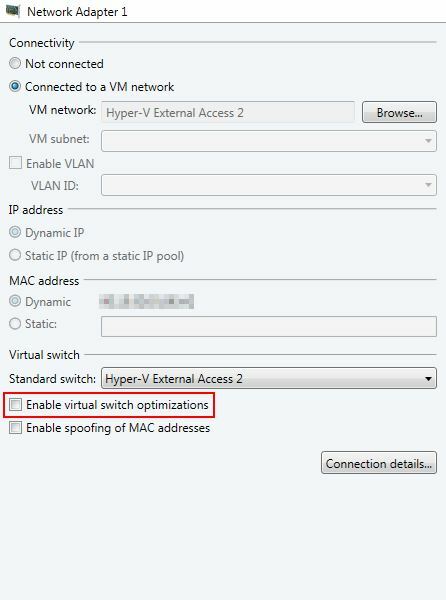 Changing the network mapping of the affected VMs to ConvergedNetworkSwitch enabled me to run the Dynamic Optimization wizard. 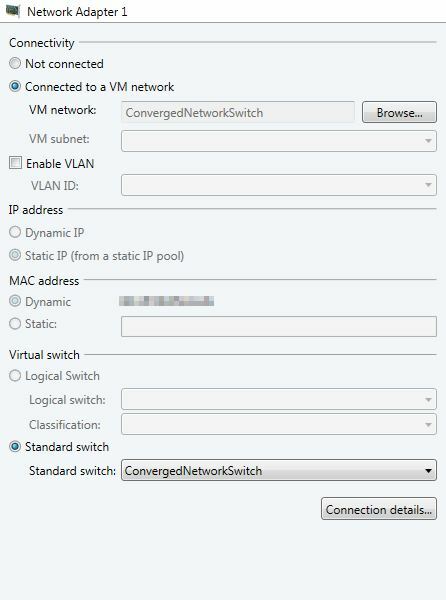 This entry was posted in Clustering, System Center Virtual Machine Manager, Virtualisation and tagged Hyper-V, SCVMM on September 29, 2014 by richardstk. I had the privilege of being a technical review on this great new book from Alessandro Cardoso. If you work with SCVMM 2012 R2 take a look. Covering : Windows 2012 R2 and Hyper-V new features, System Center 2012 R2 VMM, Operations Manager, App Controller and Azure integration as well the Veeam Management Pack. This entry was posted in System Center Virtual Machine Manager on July 16, 2014 by richardstk. During the migration from a Windows Server 2008 R2 Hyper-V cluster to one based on Windows Server 2012 R2 I have had to migrate a lot of virtual machines. The migration speed was lower than I expected given the available source and destination disk performance. On a 1 Gbps network connection, the migration was only using about 25% of the available bandwidth. 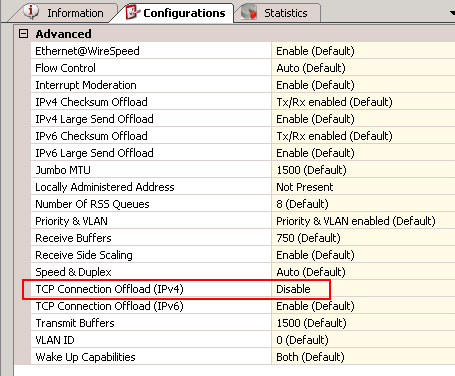 In order to improve the performance I disabled TCP Connection Offload (TOE) on the source hosts. This is because TOE can slow down the VM migration process, which takes place over BITS using HTTPS. The screenshot below shows the setting in the Broadcom software. Having disabled TOE the migration used anything up to 80% of the available bandwidth, significantly improving the migration times. This entry was posted in System Center Virtual Machine Manager, Virtualisation on April 23, 2014 by richardstk. 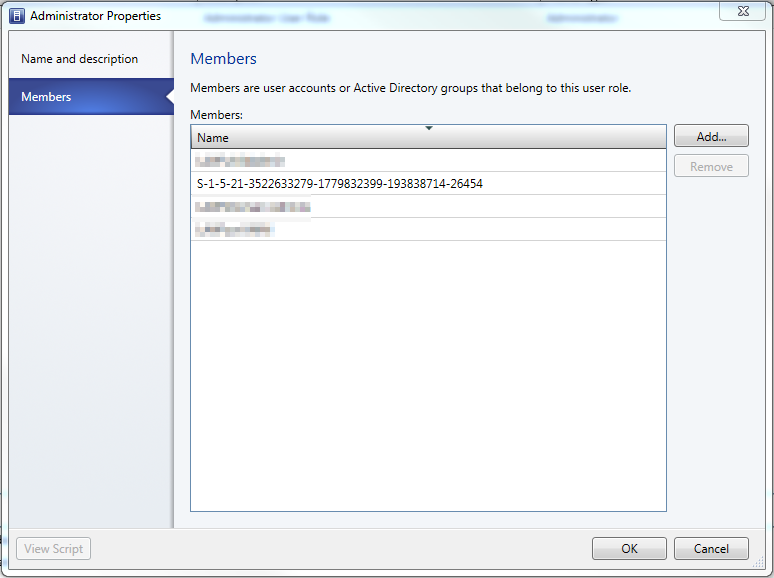 17140 – The specified account name is not valid: ‘%USER SID%’. These errors can occur if you’re using System Center Virtual Machine Manager (SCVMM). In the SCVMM console, open Settings -> Security -> User Roles. 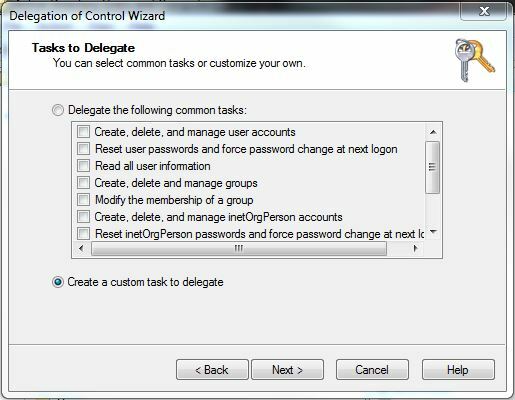 Right-click on each user role and choose Properties. Open the Members tab and look for the user SID you see in event ID 17140. Highlight the SID and click Remove. This entry was posted in System Center Virtual Machine Manager, Virtualisation on April 7, 2014 by richardstk. As all the virtual machines I create using Hyper-V have the same hardware I decided to investigate the PersistAllDeviceInstalls option for unattend.xml. 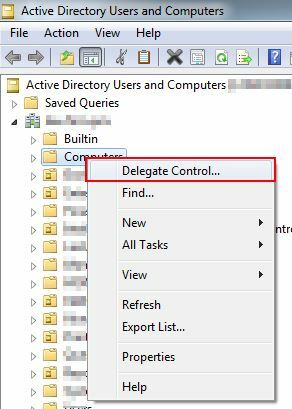 The PersistAllDeviceInstalls setting configures whether the Plug and Play devices are uninstalled during the generalize phase and then reinstalled during the specialize pass of the sysprep process. As all the virtual machines have the same hardware there’s no need to reinstall the Plug and Play devices and the result is a faster virtual machine deployment. I created a fresh virtual server template with the PersistAllDeviceInstalls setting set to true and compared the setup time to the same template with PersistAllDeviceInstalls set to false. With PersistAllDeviceInstalls set to false the setup time was 2:28. With PersistAllDeviceInstalls set to true the setup time was 1:54, a small, but 23% saving in setup time. If you want to add the PersistAllDeviceInstalls setting to unattend.xml here’s my example. 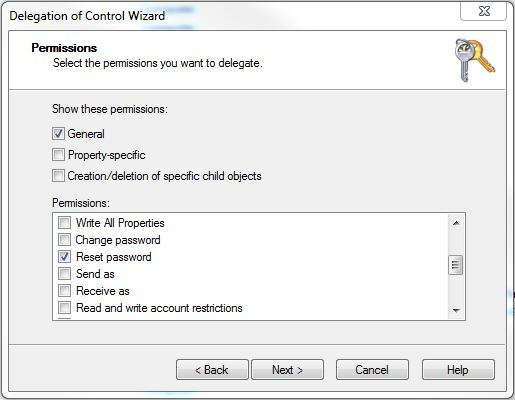 This entry was posted in System Center Virtual Machine Manager and tagged Hyper-V, Virtual machine on September 2, 2013 by richardstk.